SOURCE: Kenneth Taylor (taylork021@Hawaii.rr.com) SUBHEAD: Kauai County 2010 candidate forum in Waimea Theater on 8/30 at 5:45pm. 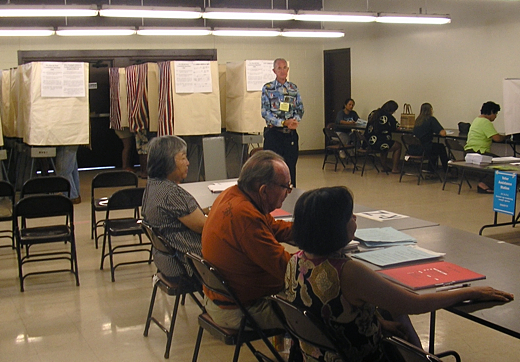 Image above: Election day 2008 at polling place in Hanapepe Neighborhood Center on westside of Kauai. Photo by Juan Wilson. Please join others from the Kauai Westside community for an opportunity to see and hear the candidates who will represent us. WHAT: Candidate Forum WHEN: Monday, August 30th, 2010 at 5:45pm WHERE: Waimea Theatre, on Kaumualii Highway Waimea, Kauai, Hawaii MODERATOR: Randy Francisco SCHEDULE: Pupus at 5:45pm CANDIDATE Q & A: 6:30pm-9:30pm PART ONE 6:30 – 7:45 pm 7th DISTRICT SENATE Alfred Darling, JoAnne Georgi, David Hamman, Ronald Kouchi, Herman Wilson, John Yamane 16th DISTRICT HOUSE Daynette Morikawa, Phillip Sterker, Roland Sagum INTERMISSION PART TWO 8:00 – 9:30PM KAUAI COUNTY MAYOR RACE Bernard Carvalho, Diana Lebedz KAUAI COUNTY COUNCIL CANDIDATES Kaipo Asing, Rolf Bieber, Tim Bynum, Dickie Chang, Theodore Daligdig III, Mizdebz DeSilva Carveiro, Dennis Fowler, Edgar Justus, Daryl Kaneshiro, Harry Kaneakua, Derek Kawakami, KipuKai Kualii, Nadine Nakamura, Melvin Rapozo, Kenneth Taylor, JoAnn Yukimura . Return to a Growth Economy? What are the Superferries Worth?